Ruadhri’s school rucksack, cartable, is worryingly heavy. Collège textbooks are all on the chunky side, and add to those classeurs (files), cahiers (exercise books) and a well filled trousse (pencil case) and there’s a lot of weight there. Rors has been allocated a locker (casier) at school to use for book storage, but they have a sharing system at Boussac, which isn’t the most practical in the world. Rors’ co-lockeree has shoved a padlock on and not given Rors a key, which seems a tad unfriendly. I was going to go in and see what I could sort out, but Ruadhri has decided he’s happier keeping his books at home and taking in what he needs for the day. This has advantages in that our youngest can be scatty so I’m pretty sure he’d be turning up regularly without everything he needed for his lessons, and so would end up getting mots (black marks), three of which mean a detention on a Wednesday afternoon. The disadvantage is, of course, the weight of gear he has to carry every day. Kid’s cartables can weigh up to 8.5kg, a survey in 2007 revealed. Medically a child shouldn’t carry a rucksack that’s more than 10% of their weight. Thus a 30 kg child should carry a maximum weight of 3kg and so on. The FCPE, a parents’ association, is working towards achieving this with the goals of seeing more ebook usage at school, and the bulky paper books being kept at home for devoirs. That sounds entirely sensible and manageable to me. Maybe I should actually join the asso this year! But for the time being, do try and minimise what goes into your child’s cartable. Take out the inevitable extras that get shoved in – books, toys, funny-shaped stones etc. And go for a rucksack-type bag, not one of these popular bags on wheels. It’s not good for kids to be dragging heavy weights behind them, since this makes their posture bad. Also, they’re having to heave the bags up and downstairs in awkward ways, which is also stressing parts of the body. 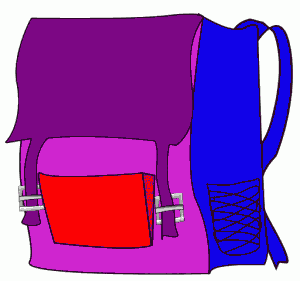 A rucksack with well tightened straps keeps the weight high up on the back, which is the best ergonomically. The fashion rampant amongst older students for having a rucksack dangling behind their bum is about the worst thing they can do for their backs as it’s straining the lumbar region. My older two went for over the shoulder bags that they wore across their chests by the time they got to lycée to help carry the weight of books more comfortably and look cool at the same time. But how healthy they were, I’m not sure. And now that they’re at uni, they hardly seem to need books at all! A Boorish Berkshire Boar OR Oberon’s New Abode Oh Là Lapins !